Slowness of the recovery is its most amazing characteristic. The headline number of today’s job report is the same old same old — which tells us something important: this recovery is nearing its end. This recovery has been slow and steady. It has frustrated the bulls who in 2009 predicted a V-shaped recovery — and since have incessantly predicted a “take-off” really soon. Corporate profits, CEOs’ income, and asset prices have been the only booms. And it has frustrated the bears, who predicted no recovery in 2009-2010, and since then frequently predicted either a fall back into recession or inflation, or both. We got none of these scenarios. The slowness of the recovery is its most amazing characteristic. Most of the major economic indicators show this, but none more clearly than jobs and income. 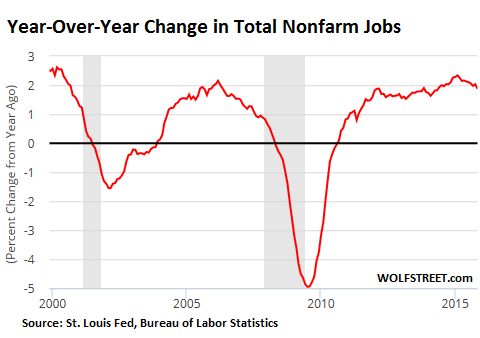 Here is year over year (YoY) growth in non-farm jobs during the past three cycles. After the recession (August 2009 – November 2011), job growth took three years to accelerate up to slow growth — and has remained in slow gear for the past four years, running between 1.6% – 2.2% YoY. This hasn’t added up to much: 6 1/2 years (72 months) of recovery has given us only a 3.3% gain in jobs from the December 2007 peak. The anemic boom-fed 2001-2007 recovery did better, although lasting only 81 months: a 4.2% gain in jobs. To see what the US economy can do, look at the powerful 1990s boom: jobs up 14.8% at this point (eventually topping out at a 20.9% gain after 128 months). The big news in the recent employment reports has been the average weekly earnings of production and non-supervisory workers (i.e., most Americans). It grew at 1.7% YoY in November. Even with our low inflation, that’s nothing to cheer about. And it’s below the 2.3% YoY average since Dec 2007. 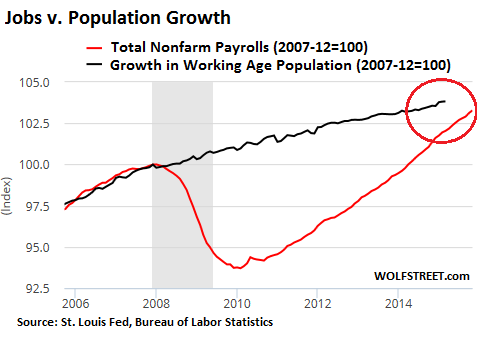 Economists have predicted that wage growth would accelerate soon, because they see this data, looking at growth since the December 2007 in payrolls (jobs) vs. that of the working age population (the population data is as of March). The lines will cross soon, 95+ months since the previous economic peak, showing that working age population has grown at the same rate as have jobs. 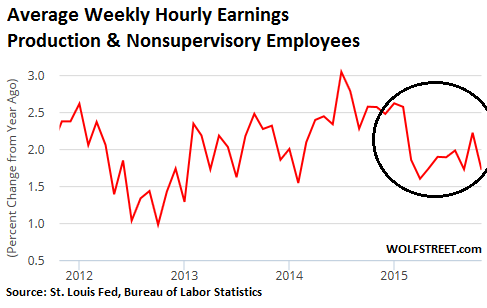 This is when wage growth (wage “inflation” to CEOs and Wall Street) should begin. This never happened in the weak recovery after the tech crash. Unlike the powerful 1990s recovery, when job growth exceeded population growth — hence the increase in wages and strong overall economy. Look at this amazing chart below! The jobs data and unemployment claims say that we should be at or near full employment, with employers forced to increase wages of many workers to retain them and recruit new ones. Instead, after February, wage growth in the private sector has slowed. Average hours worked per week has been flat since Summer 2011 at 33.7. The slump has been in growth of hourly earnings. The economy’s “animal spirits” are fading. On the other hand, weekly earnings for supervisors and managers in the private sector have been rising at 3.5% – 4% for the past year! Today’s jobs report shows that the recovery continues. But it is a lagging indicator, a look in the rear view mirror. This is why the headline number will have little effect on the Fed’s decision. Rather, they’ll look at the weak wage growth data. In our consumer-driven economy, that’s bad news. On the other hand, the Fed Governors are desperate to normalize interest rates, which will give them ammo to fight the next recession. But coincident and leading indicators show that the economy is slowing; raising rates significantly will slow it further and perhaps start the recession. Also, raising rates significantly while most other major central banks are easing will send the already strong dollar even higher — further depressing US exports and causing more turmoil in the emerging nations. So the Fed might increase rates in December and again over the next few months, but there will be no cycle of rising rates. The recovery’s peak is near. A recession looms ahead, perhaps in 2016. The bottom line: The 2008 crash was not your Father’s recession. The recovery since then is unlike anything in the post-WWII era (1950-2000). That’s why so many economists’ forecasts have proven wrong. Expect the unexpected. By Larry Kummer, Editor of the Fabius Maximus website. The new jobs are for a lot less money and are going to people who are taking a pay cut to stay employed. 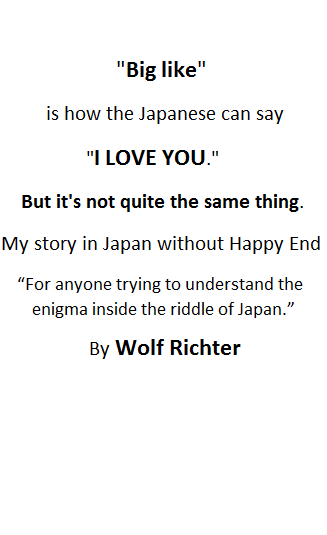 Unfortunately, I know this is the case. Nobody is getting a raise, they are being replaced by lower wage employees. It is happening everywhere. rising health care costs have eaten away most discretionary income. rising immigration has pulled down wages, and increased gov’t spending–along with rising numbers on permanent disability. rising productivity & tech means more people can be fed & housed cheaply. but not enough middle income tax payers to pay for all govt outflow spending of non-productive class. Both the very wealthy & the very poor seem to be ganging up on the working class producers. That graph looks to me the largest dead cat bounce on record! You young ones best get a good Government Job. Sit this One out. The full double dip recession. I still believe we have yet to see the second down leg of what should have been the double dip recession of 2008 2012. All the financial engineering of the last 7 years has simply prolonged the upswing, before the second leg of the double dip, cycles and charts dont care about time like people do. Excessive Fed/CB interventions, in natural cycles, simply make a big big mess.